Introduction to Nuclear Magnetic Resonance (NMR). Additional information. This is a brief description about spectroscopy by Nuclear Magnetic Resonance intended to extend the basis of this technique not explained in the introductory chapter of my PhD Thesis. NMR is a powerful and harmless tool used for biophysical characterization of molecules with atomic resolution. Nuclear magnetic resonance (NMR) spectroscopy is a technique that takes advantage of the quantum mechanical properties of the atomic nucleus known as spin. Nuclei with spin quantum numbers different to zero behave with a finite charge distribution, thus having a magnetic moment proportional and parallel to the nuclear spin. These nuclei act like tiny magnets (dipoles) and can be, in principle, detected by NMR. When a sample is placed in a stationary magnetic field (B0), its NMR active nuclei tend to align parallel or antiparallel with that external field. The dipoles oriented against the B0 are in a less stable state and are present at a lower population. The sum of all nuclear magnetic dipoles gives rise to the net magnetization (M). When the sample is irradiated with photons with a determined amount of energy (a radiofrequency pulse), the net magnetization will change from its equilibrium state to a less stable one, afterwards, when the system goes back to its initial state, a signal is emitted and recorded. NMR spectroscopy measures the energy absorbed during this process within the radiofrequency (RF) spectrum. The energy difference (ΔE) between the less and more stable spin levels is proportional to the magnetic field (B0) and the nucleus associated dipole moment (μ). Simultaneously, μ values depend on the gyromagnetic ratio (γ) and the nuclear spin (I) values, which are characteristic of each isotope. When a system at an equilibrium within the presence the an external magnetic field B0, the application of a determined radiofrequency pulse will tilt the net magnetization from the z axis. The resonance phenomenon occurs when this applied radiofrequency pulse matches the energy difference (ΔE) between the nuclear spins levels. The energy of the absorbed photon (E = hv0, being h the Planck’s constant and v the frequency, see equation below) depends on the resonance radiofrequency that has to be matched. The tilted net magnetization evolves as a time-dependent manner in order to recover its equilibrium; in other words, the nuclei return from a higher energy state (β) to their initial lower energy state (α), releasing energy during this process, and this decay renders the FID (free induction decay). The FID is recorded during a specific time range and given that in this time domain the signal is not fully interpretable (the signal obtained from each nuclei is mixed), the Fourier transform is applied to convert the time-dependent signal into a frequency domain. The individual contributions of the different spins to the FID are separated by means of their resonance frequency. When a radiofrequency pulse is applied, all spins may experience the same effect; however, if the time length of the pulse applied is very long (in a so-called soft pulse), the range of frequencies excited is narrow. This soft pulse can be used to selectively excite determined ranges of frequencies, and in solution NMR is widely used to saturate the water signals without altering the rest of the frequencies. Given that NMR is a low sensitivity technique, high concentrations of the sample and a strong external magnetic field are necessary. At the same time, the correlation time increases as the molecule size does; this means that bigger molecules experiment slow tumbling, which results in signal broadening and low-informative FID. In protein NMR, small polypeptides might be suitable to be studied with their naturally abundant NMR-active isotopes (1H, 13C, 15N) if the signal overlapping is not exaggerated. In the case of polypeptides usually greater than 15 kDa, the isotopic labeling and multidimensional NMR spectra recording is mandatory since the natural abundance of 13C and 15N is low. 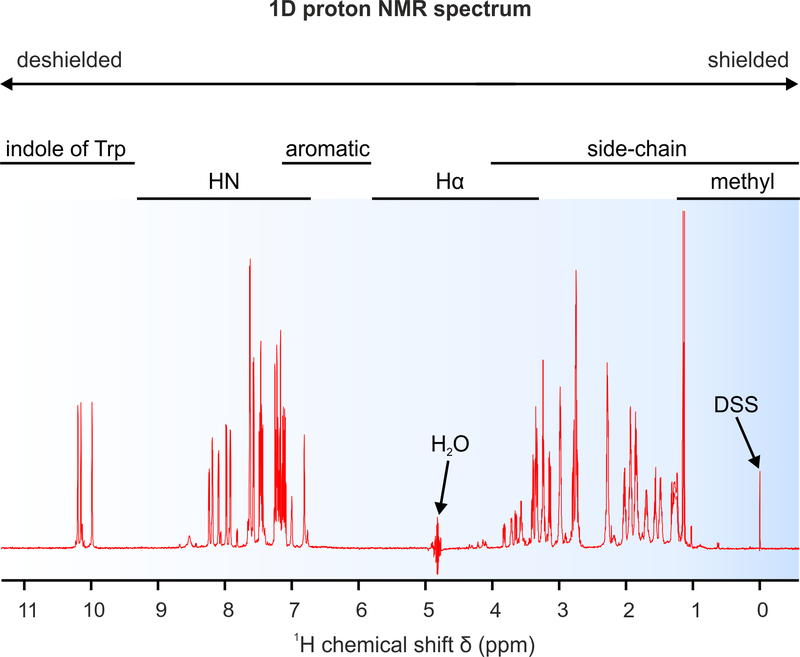 Monodimensional or 1D NMR spectra recording for big biomolecules is useful as it allows to determine if the sample is soluble, properly folded or on its native state. It is also useful to evaluate if further and more time consuming experiments should be performed, to find if the signal/noise ratio is acceptable, to analyze the possible presence of contaminants or any alteration, and so on. In 2D NMR, the resonance signals are plotted as a function of two different frequencies (ω1 and ω2). On these kind of experiments, different coupling interactions can be detected: through-bond (J) scalar couplings and through-space (NOE) couplings. Regarding two-dimensional NMR, there are several experimental set-ups developed for the study of biomolecules. In this section, the most commonly used are described below. The TOCSY experiment is similar to the COSY, it relays on the scalar couplings between protons of the same spin system. This means that in a polypeptide chain, nuclei (protons) corresponding to the same residue (connected by a chain of couplings) will give a series of cross peaks between them. The Nuclear Overhauser Effect (NOE) is the most important NMR parameter under a structural point of view. During the NOE effect, the magnetization is transferred between nuclei that are close in space and therefore, the intensity of the NOE signals observed depends on the distance between the nuclei in an approximate relation of 1/r6 or up to 5 – 6 Å. 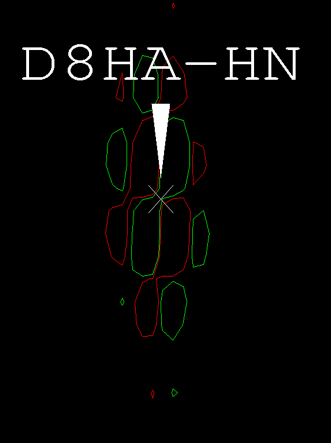 The NOE intensities are calibrated and traduced into distance restraints, this restricts the conformational space in which the polypeptide folding can occur. The Heteronuclear Single Quantum Coherence spectroscopy (HSQC) pulse sequence is often used to obtain a spectrum in which one axis corresponds with the proton, while the other one with a heteronucleus (usually 15N or 13C). The resulting peaks correspond with the heteronucleus directly attached to its correspondent proton nucleus. This kind of spectra can be used as an aid for the unambiguous identification of the proton attached, concurrently, the chemical shift values obtained for the heteronucleus can be used in the prediction of the polypeptide backbone and side chain torsion angles. A qualitative analysis of the structure can be performed based on the chemical shift values of the backbone atoms. A chemical shift deviation plot of the carbon and proton α (mainly) can be visualized and evaluated by subtracting the value that would obtain the same nucleus in a random coil (rc) conformation (Wishart et al., 1995). Once all or nearly all the present nuclei are identified during the spectra assignment task, a series of angular and distance constraints are generated. The structure calculation consists on finding the group of conformers from which the atomic coordinates fulfil the experimental restrictions. The calculation algorithms consist on the minimization of a variable target function done trough the extrapolation of the conformational space, the target function value is zero if all the experimental restrictions are satisfied.